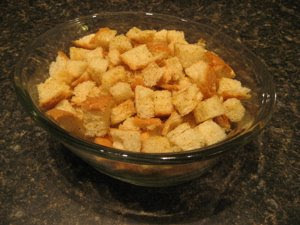 I love making homemade croutons. They taste so much better than the store bought kind, they are cheaper, and they are really easy to make. I dont really measure anything but just throw dashes of everything together. First cut bread into desired size cubes. Then drizzle the cubes with a little olive oil. Then add all of the seasonings. Then sprinkle on parmesan cheese (I add quite a bit). Spray baking sheet with cooking spray then spread cubes across the sheet in a single layer. Bake @ 170 degrees for about 2 hours stirring croutons occasionally. Turn oven off after 2 hours and leave croutons in oven for another half hour. Then make a nice big salad and enjoy your croutons. I store my leftover croutons in tupperware in the fridge.